There’s a race on to develop the technology that will power the next generation of cars. Some of the biggest and smartest car companies, such as Honda and BMW, are making huge bets that hydrogen is going to replace oil as the car fuel of choice. (To wit: The Honda FC Sport we recently reviewed). Another group of car companies, mostly small start-ups based in the greater San Francisco area, think the next automotive paradigm involves electric power. Of that second group of car companies, one of the most promising startups is Aptera and its soon-to-go-into-production 2e model. 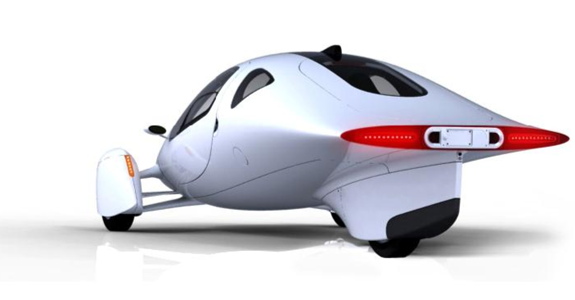 If you think that the Aptera 2e (pictured above, and below) looks like a little like a small airplane without wings that is because, well, it sort of is. For your average car on the road today, 60 to 70% of the gas consumption goes entirely towards moving air out of the way of the vehicle. Aptera engineers knew that decreasing drag was key to increasing efficiency. So they modeled their new car’s design upon that of the most aerodynamic jet planes. The resulting Aptera 2e has a drag coefficient of .15, which, amazingly, is a little less than the Lance Armstrong produces cycling his 10 speed! Around 10% of a normal car’s energy goes toward overcoming the friction caused by the tires on the road. To combat this Aptera got rid of one of those tires on the 2e. Other car companies have tried selling three-wheeled vehicles before, always to spectacular failure. The problem has been that three-wheeled cars were unacceptably unstable. Not looking to repeat history, Aptera designed the 2e with two front tires that are slightly wider apart than your average car. That long front axle, combined with the 2e’s low center of gravity, allow Aptera drivers to confidently take corners at high speeds even with only the one rear wheel. The Apera 2e’s composite metal body structure is also incredibly light. The whole car weighs less than a smaller Smart Car Fortwo does. 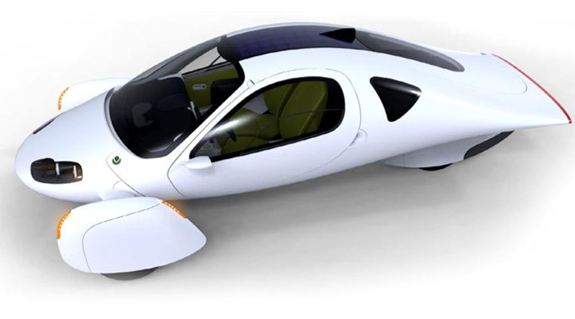 Into the 2e’s lightweight, low-drag, three-wheeled body Aptera has put a relatively conventional electric engine. The 2e can reach speeds of around 75mph (120 km/h) and go around 120 miles (190 km) on a single charge. It takes about eight hours to recharge the car through a normal residential outlet. Aptera claims that the 2e’s low weight and small size will not compromise passengers’ safety, pointing out that the frame of the 2e is so strong that it could withstand two elephants standing upon it. Spot Cool Stuff would point out that no independent crash tests have been performed on the Aptera 2e, to say nothing of independent elephant tests. It is too early to know how safe the 2e is. It is not to early to put down your $500 deposit on a 2e if you live in Aptera’s California test market. The full cost of the Aptera 2e is expected to be a very reasonable $30,000. 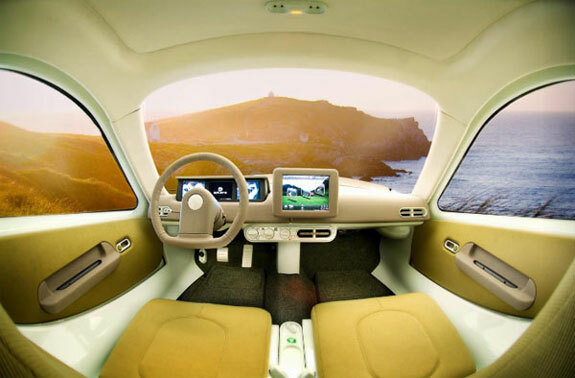 For that you’ll get a car that full of features including solar assisted climate control (there are panels on the 2e’s roof), a high-end stereo, LED lighting (in and out), dual airbags and a monitor that can display a GPS system, a rear-view camera and a movie from the built-in DVD player. 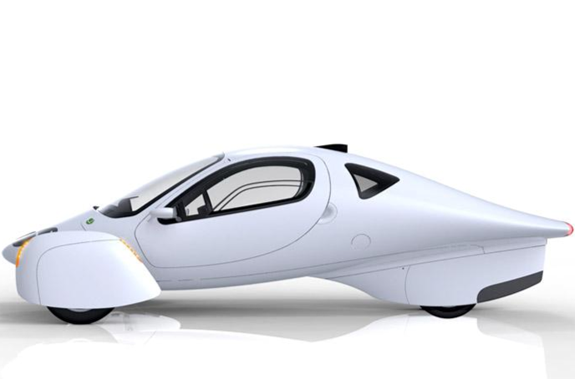 Next up for Aptera: a gas-hybrid version of the 2e that is expected to get 300mpg and be available for sale in 2010. 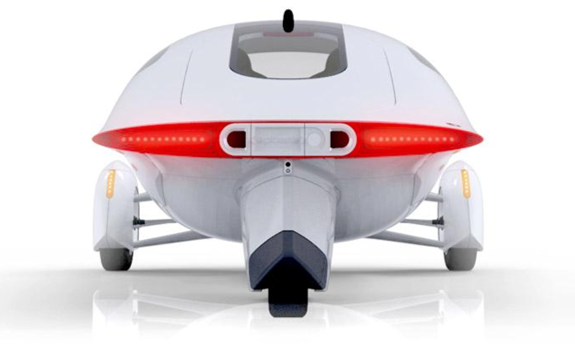 After that, Aptera plans to develop models suited to markets outside of California, including cars can handle snow and that have room for four or five adults. Spot Cool Stuff will be watching with great anticipation. 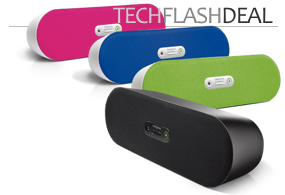 I’ve been following this company and it’s development process for 2 years or so and while I am very interested in the products they are still “Vaporware” in my book. They look great, the efficiency sounds like it’s awesome and the price is even supposed to be within range of the average buyer. BUT you still can’t buy one and they are not releasing any hard or soft dates for availability on the east coast. So while all the talk is nice and they have demonstrated great prowess in pumping and riding the hype delivery is illusive. Sure you can put down $500 for a reservation (when the site is working correctly) but that still won’t get you a car you can drive or even a promise of when you will. So continue to hold out and hope they actually make it to market OR go with another manufacturer? I’ve been waiting over 2 years just to hear when they will be selling on the east coast and so far ZIPPO. 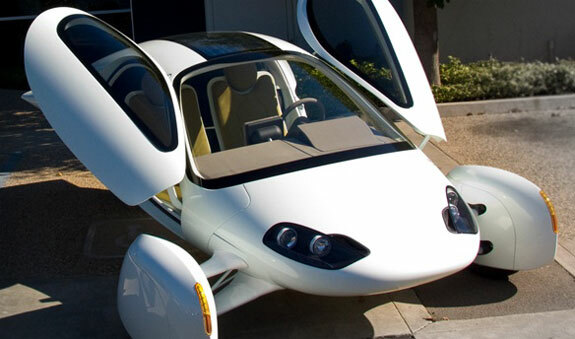 I used to own a Prius and I’m seriously giving them another look but I’d rather buy an Aptera. Patience is a good thing, but too much of it goes NOWHERE. This is a great looking car and for me it would be a great investment. One of the reasons is that there is nothing else like this on the road. It would save me quite a bit of money on gas seeing that my truck and SUV get at the best twenty miles per gallon. I hope that they become available in other states soon. Yes indeed this is a nice vehicle, just hope the price is affordable for the masses! Thanks for the pics, good quality, hadn’t seen these before.